Surprisingly after hitting the Invalidation mark as talked about in the previous report Gold (XAU USD) is moving up. Currently I’m out of the market and waiting for confirmation but this is indeed a very interesting situation. Theoretically Wave 3 can not be the shortest, in this case it is shortest by 2-3 ticks, it seems that this small difference is being ignored by the market given the fact that Gold is traded in highly leveraged futures contracts. 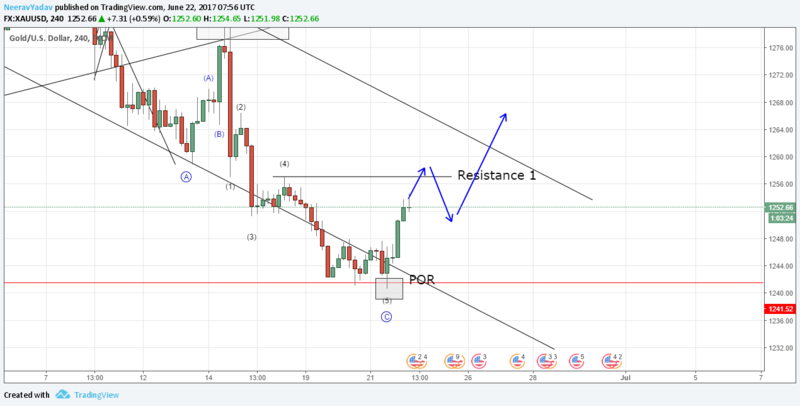 If the Wave C in Gold has completed at the 1240.85 level then what generally happens is that the market goes to test the Wave 4 level on the chart and once it is breached we have a small 5 leg up move completed by then which is followed by a 3 leg correction and then when the new formed high above the Wave 4 of one lesser degree is breached we call it a confirmation.